This beautiful boxed set makes a perfect gift for readers of the beloved fantasy series praised by George R. R. Martin, Junot Díaz, and Erin Morgenstern. Quentin Coldwater is brilliant but miserable. A high school math genius, he’s secretly fascinated with a series of children’s fantasy novels set in a magical land called Fillory, and real life is disappointing by comparison. When Quentin is unexpectedly admitted to an elite, secret college of magic, it looks like his wildest dreams may have come true. But his newfound powers lead him down a rabbit hole of hedonism and disillusionment, and ultimately to the dark secret behind the story of Fillory. The land of his childhood fantasies turns out to be much darker and more dangerous than he ever could have imagined . . . The Magicians is one of the most daring and inventive works of literary fantasy in years. No one who has escaped into the worlds of Narnia and Harry Potter should miss this breathtaking return to the landscape of the imagination. Accompanied by his oldest friend, Julia, Quentin sets off—only to somehow wind up back in the real-world and not in Fillory, as they’d hoped. As the pair struggle to find their way back to their lost kingdom, Quentin is forced to rely on Julia’s illicitly learned sorcery as they face a sinister threat in a world very far from the beloved fantasy novels of their youth. Quentin Coldwater has lost everything. He has been cast out of Fillory, the secret magical world of his childhood dreams that he once ruled. With nothing left to lose he returns to where his story began, the Brakebills Preparatory College of Magic. But he can’t hide from his past, and it’s not long before it comes looking for him. Meanwhile, the magical barriers that keep Fillory safe are failing, and barbarians from the north have invaded. Eliot and Janet, the rulers of Fillory, embark on a final quest to save their beloved world, only to discover a situation far more complex—and far more dire—than anyone had envisioned. Along with Plum, a brilliant young magician with a dark secret of her own, Quentin sets out on a crooked path through a magical demimonde of gray magic and desperate characters. His new life takes him back to old haunts, like Antarctica and the Neitherlands, and old friends he thought were lost forever. 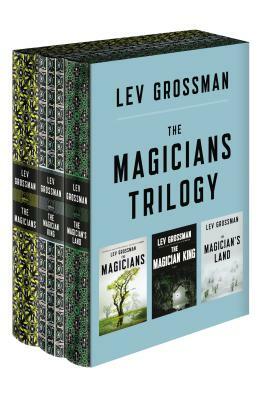 The Magician’s Land is an intricate and fantastical thriller, and an epic of love and redemption that brings the Magicians trilogy to a magnificent conclusion, confirming it as one of the great achievements in modern fantasy. Lev Grossman is the book critic for Time magazine and the author of five novels, including the international bestseller Codex and the #1 New York Times bestselling Magicians trilogy. A graduate of Harvard and Yale, he lives in Brooklyn with his wife and three children. “The Magician’s Land . . . does all the things you want in a third book: winding up everyone's stories, tying up the loose ends -- and giving you a bit more than you bargained for. . . . Starting very early in Magician's Land, Grossman kicks off a series of escalating magical battles, each more fantastic, taut, and brutal than the last, which comes to a head in the final chapters with a world-shattering Götterdämmerung scene that stands with great war at the climax of The Return of the King. At the same time, Grossman never loses sight of the idea of magic as unknowable and unsystematized, a thread of Borgesian Big Weird that culminates in a beautiful tribute to Borges himself. It's this welding together of adventure-fiction plotstuff and introspective, moody characterization that makes this book, and the trilogy it concludes, so worthy of your reading time, and your re-reading time.